​​Depending on who you ask, creative problem solving describes both the mindset with which one approaches problems and the methods they use to solve them. We sometimes refer to people who are creative problem-solvers as people who think “out-of-the-box.” The creative-problem-solving approach​​ to challenges ties in with the previous discussion of frustration tolerance in that people who are engaging in creative problem solving are able to try new approaches to problems without being discouraged or becoming frustrated. Spontaneity is defined an “adequate response the a new situation, or the novel [and adequate] response to an old situation,”1 or when we “act appropriately to an unpredictable situation without a second thought, inhibition, guilt, or self-doubt”2. Why are creative problem-solving skills important? Creativity and innovation are hallmarked as “21st century skills,” determined to be absolutely necessary for young people to participate in the global economy of the modern age. We could line out all of the reasons why creative problem solving and innovation improve job prospects and economic outcomes, but we’re not occupational therapists. Research shows that creative problem-solving and spontaneity help reduce anxiety and improve self-esteem and self-efficacy. People with creative problem-solving skills are happier because when they face a challenge that they don’t know how to overcome they come up with new ways to solve it, or ways to use previous successes to approach new challenges with an open mind. They believe in their own ability to overcome obstacles. 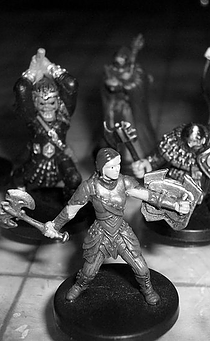 How do tabletop role-playing games help build creative problem-solving skills? Because they are set in an open world, tabletop role-playing games provide an opportunity for players to come up with novel ways to face challenges. If the group of adventurers needs to get into the inner sanctum of a castle, there are multiple ways to get there. They can steal some uniforms and disguise themselves as royal guards, they can sneak in in the middle of the night, they can fight their way through the front door in heroic combat, pretend to be a troupe of roaming minstrels, and so on. Of course, tabletop role-playing games provides the opportunity for players to set goals, make plans, and execute them to the best of their ability. It also forces players to adapt when things don’t go smoothly. What do the players do when their guard disguise is discovered, when the late-night cleaning crew is in the chamber, when the entrance to the castle is blocked, or when the king hates musicians? The amount of opportunity for creative problem-solving depends on the specifics of the role-playing game, of course, and the game master who is creating and facilitating the experience. How do we intentionally focus on creative problem-solving skills in Wheelhouse Workshop groups? We build creative problem solving opportunities into our game session by providing open-ended challenges, as opposed to a logic puzzles, riddle, or linear obstacles, and then pushing our players to persevere and adapt as the problem changes. Logic puzzles, riddles, and linear obstacles have their place in Wheelhouse Workshop groups too, but when we are working on building creative problem-solving skills, we want to give our players opportunity to come up with novel solutions and to continue coming up with new solutions when they aren’t instantly successful. Game Master: As you walk into the next room, you notice that this square room has stone bricks along each of the four walls, covered in dust and grime. It looks like the room hasn’t been touched in many years. Across from the doorway you entered you see another large wooden door with heavy metal bars blocking the way. As you step into the room you hear a click, and the door slams shut behind you. In the center of the room is a large lever. Player: I pull the lever! Game Master: As you pull the lever, you hear the sound of grinding gears beneath the stone floor and along the side of the walls. When you look up, you see spikes slowly start lowering from the ceiling. …and that is where the planned part of the lever puzzle ends. The players now need to think creatively about how to escape the spikes. Do they try to stop the spikes? Do they try to move into the blocked door or retreat? The decisions they make and their successes are all improvised in the moment, as is the game master’s response. As game masters, we want to reward creativity and encourage players to continue coming up with new solutions. If a player’s first solution is to go independently to simply pull the lever again, it won’t work. The solution can’t be obvious; we want the players to think laterally. Some of our favorite solutions to this open-ended challenge include a wizard using a fly spell to investigate the spikes and jam the gears, a dwarf breaking the lever open to reveal another set of controls, and a rogue finding some exposed mechanisms behind a false rock in the wall and tossing a pineapple into the gears. 1. Moreno, as cited in Sternberg, P., & Garcia, A. (2000). Sociodrama: Who’s in your shoes? Westport, CT: Praeger, p. 124. 2. Moreno, as cited in Davelaar, P., Araujo, F., & Kipper, D. (2008). The Revised Spontaneity Assessment Inventory (SAI-R): Relationship to goal orientation, motivation, perceived self-efficacy, and self-esteem. The Arts in Psychotherapy, 35, 118. Part 0: What Exactly Is a Tabletop Role-Playing Game Anyway?